There’s a philosophy that not having expectations means you’re likely to never be disappointed. Don’t have high expectations for that date, and you won’t be let down when they walk out on you after the first drink. In the same vein, if you don’t have expectations headed into an event, that makes a positive occurrence all the more joyous. Not much expectation comes with a college receiver whose best season, after five years with his program, was a mere 58 catches for 865 yards. Yet, perhaps it was those lack of expectations that made the discovery of Malcolm Mitchell’s ability through his Reception Perception results all the more sweet. Once a high-value recruit to the University of Georgia in 2011, and subsequently earning Freshman All-SEC honors, Mitchell soon fell through the cracks. He sustained a torn ACL in the first quarter of the 2013 season-opener and missed the rest of that year. Returning in 2014, it was clear Mitchell was not the same player right away. He started just three games and averaging a meager 8.0 yards per reception. 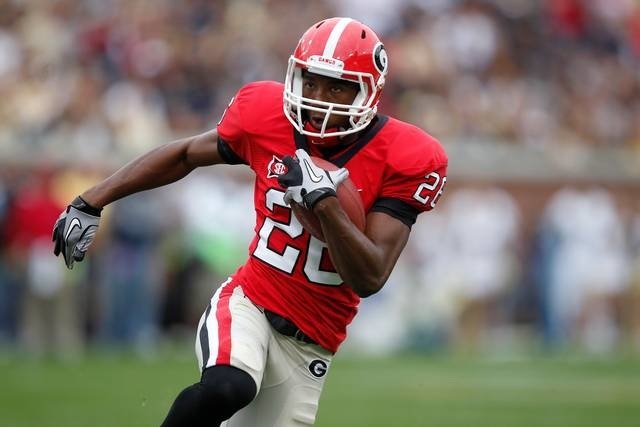 With his future career in the balance, Malcolm Mitchell stepped up to the challenge. He started every game for the Bulldogs and recorded his best collegiate season in 2015. Lauded for his work-ethic and character, he earned the David Jacobs Award, which the university’s team website describes as “given annually to the player who best portrayed courage, spirit, character and determination”. From the comeback to his on-field play, Malcolm Mitchell proved himself as someone with an NFL future. A closer look through his Reception Perception reveals that future might just be brighter than any previously imagined. Mitchell primarily played the split end position for Georgia, taking 40.8 percent of his snaps at right receiver and 51.8 percent on the left, while setting up on the line of scrimmage 76.1 percent of the time. Mitchell measures in at just 6’0” and 198 pounds, so perhaps he doesn’t routinely play that position in the NFL. However, we watched players like Jeremy Maclin lead productive passing offenses with similar dimensions in recent years. The Bulldogs aren’t known as a high-flying or voluminous passing attack. With a habit for churning through strong running backs prospects of late, they run one of the more conservative offenses in college football. The team just doesn’t ask much of their receivers. Even the great A.J. Green never reached 60 catches or 1,000 yards in any of his three seasons there. Malcolm Mitchell was no exception as the lead receiver in 2015, but what they did ask of him, he executed with precision. ​Georgia primarily wanted Mitchell to be a chain-moving intermediate threat, and that’s where he functions best as a receiver. 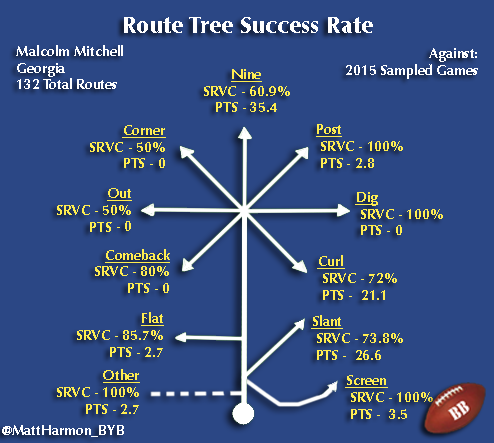 50.7 percent of the routes he ran in his Reception Perception sample were slant or curl patterns. Talk about a skewed chart. The only other route he ran at a rate above the class average was the comeback. Mitchell’s college usage represents a player that will fit well in a timing-based offense that makes their living off a quick passing game. Again to make the allusion to Jeremy Maclin, the use of the veteran receiver in his first year with the Chiefs is a strong parallel to Mitchell’s final season at Georgia. Of course, we know Maclin is also a more well-rounded player than just one who executes on short and intermediate patterns. During his year as the lead receiver in Chip Kelly’s Eagles offense, Maclin was a vertical threat, in addition to separating on a variety of routes. We need to look at Malcolm Mitchell’s Success Rate Versus Coverage scores to determine if he too holds the same ability. Outside of the corner and out patterns, none of Mitchell’s SRVC scores stand out as particularly poor. He only ran those on a grand 4.5 percent of his 132 routes anyhow. Mitchell did not score as well as some of his peers on slant routes, his highest assigned pattern, and there were moments when his execution could have been better. However, he produced an above average PTS total on slants and curl routes, and his SRVC scores aren’t low enough to be a concern when viewed in conjunction with how often Georgia assigned him those routes. Elsewhere, we do gain evidence that there is more to Mitchell’s game than just an underneath receiver designation. He scored a 60.9 percent SRVC on nine routes, showing off solid down the field speed, but hinting at a few more detailed attributes. One of the most important aspects to observe when scouting college receivers is how they function in tight coverage. Mitchell is quite comfortable in that regard, and looks to win the fight with the defender all the way down the field. Demonstrating a finishing touch, Mitchell’s 66.7 percent contested catch conversion rate checks in above the class average. While he likely will not develop into a premier NFL deep threat, Mitchell’s next team can take solace in his ability to separate down the field, and strength at the catch point if they need to take a shot down the field in his direction. At his peak, Mitchell is one of the most polished, decisive and sharp route runners in this year’s draft class. His 100 percent SRVC on posts show off his crisp work and suddenness at the break points of routes. Demonstrating good timing, mixed in with excellent explosion, Mitchell can leave a defender completely in his dust when he deceives a corner. Another area that exemplifies this is his above average 80 percent SRVC on comebacks. Mitchell knows how to sell the vertical pattern before cleaning breaking back to the cornerback. 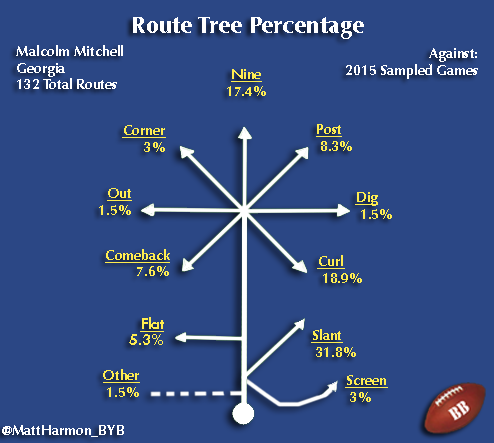 There were a few games sampled where Mitchell’s consistency with disciplined route-running came and went in waves. The flashes are as good as any player outside of Sterling Shepard in this rookie crop, but he’s not there on a route-to-route basis yet. He needs to solidify his technique to the point where it influences nearly every pattern he runs if he wants to earn a spot as an NFL starter. With that being said, Mitchell’s overall SRVC scores show that the positive flashes outweigh the lapses of inconsistency. It was at this point of his Reception Perception evaluation that Malcolm Mitchell pounded the table to be taken seriously. His SRVC against man was a top-five finish in the class, while his zone and press marks were both in the top-eight. Those metrics simply blow away a number of the receivers talked about in higher regard than what Mitchell carries in the draft community. It underscores that this is a player who routinely got open, executed his assignment and flashes NFL starter ability. I hesitate to always trust myself, but I definitely trust the Reception Perception methodology. Yet, even so, in moments like this doubts creep in about whether I should listen to what the results are screaming at me to realize. At the time I charted him, there weren’t many analysts talking up Malcolm Mitchell, and there were even repots he could go undrafted. So why does he score so well in my process? Am I just crazy? It’s fair to wonder for multiple reasons. Not long after Mitchell came out and vindicated Reception Perception at the NFL Scouting Combine. His 4.45 40-yard dash validated his play speed, his 129” broad jump actualized the explosion he uses as a route runner to consistently separate and his massive 10 1/2” hands underscore why he is such a clean catcher in contested situations. Those figures fall in the 72nd, 91st and 97th percentile, respectively, among draft prospects tested since 1999 (per Mockdraftable). It all checked out. When the metrics, the film and the physical ability all point to the same conclusion on the player, it’s the sign you need to stop questioning the results. I still might be crazy, but I’m trusting Reception Perception on this one. With some of the best scores in the class in a variety of charted Reception Perception statistics, and coming with a multi-faceted skill set, we need to take Malcolm Mitchell seriously. At this point, he should find a home squarely inside any top-10 rankings of this year’s wide receiver class. Mitchell was a always a prospect with an NFL projection, but in light of his Reception Perception results we’re left to wonder just how high that projection can be. The results say it’s more than fine to let your mind wander on that one.